It’s been an exceptionally difficult year for me, the main challenge being the steady decline of my husband — both physically and mentally — to the point where much of my time and energy has been given over to his care. Part-time caregiving help from March into September lightened the load considerably and gave me some unfrazzled studio time many days. But it wasn’t enough, and in the end John was hospitalized for a few days in mid-September, then moved to a rehab facility and thence (several weeks later) to a long-term care situation. Somwhere in the midst of this exhausting and discouraging time, I welcomed the lovely creature you see above into my life as my Studio Cat. Her name is Pikake. She’s a Chocolate Lynx Point Siamese, and turned one year old on November 1. When she arrived in mid-July, she was frightened, skittish, and stayed in hiding in my storage closet nearly continuously except at night when I wasn’t here. That too was discouraging, but I gave her plenty of time and space to settle in — which took many weeks. Now, however, she is “out” all the time, has become securely attached to me, and spends as much time in my lap or very close by as she can manage. She’s perfect in every way, and her reliable adoration and playful shenanigans are a daily reminder of the goodness of life. 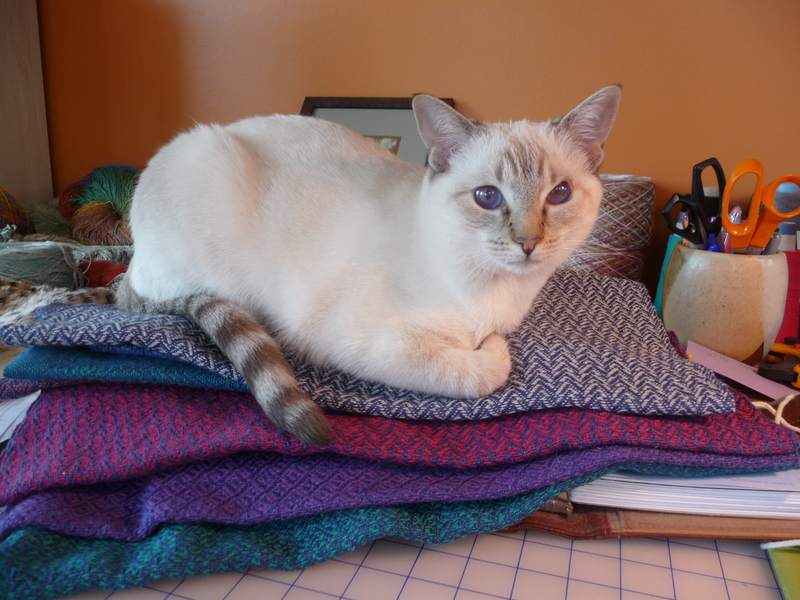 In the picture above, she’s testing out a recently-completed run of kitchen towels — the Blueberry Series — which I am in the process of hand hemming in preparation for a show at the end of November. 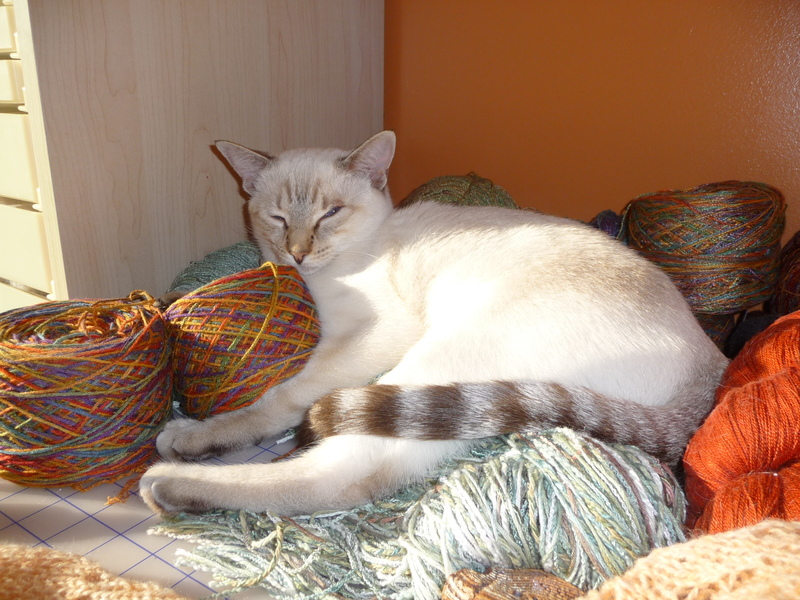 And in this photo, she’s sleeping in her favorite spot amongst some of the raw materials for future work. The sun (occasionally, at this time of year) shines right on her in the mid-afternoon, and she devolves into a state of immobile bliss. Truly light in this dark time. Pikake – what a great name, and she’s lovely. So glad you have her as a companion during these days, especially as you lose your long time companion kitty. I’m thinking warm thoughts for you and keep thinking it’s time to get myself to your studio. Perhaps next week. Cross your fingers. Take care, dear Anne. I`m so happy this worked for you Anne. I just knew that (after all we went through in trying to get Luna-chan to you) that something really good would happen for you. It did…Pikake!!! I think Luna-chan was just meant to stay here in Japan with us. She and Shadow are inseparable now and are constantly busy terrorizing everything that moves outside, and remodeling our house inside…never a dull moment! Take care, and “HI” to John. Pikake is a beautiful girl and I’m glad she’s there to take care of you. I had a similar helper — her name was Ozette — a little darker in color but basically the same. She will help you through these things, I’m sure. Sending you warm hugs for comfort. Thank you, Barb.� What I didn’t say in my blog is that my REALLY old (just short of 21) seal lynx point cat is slipping away this week.� She’s been my at-home constant companion since she was a tiny kitten, so this is hard stuff to contend with. 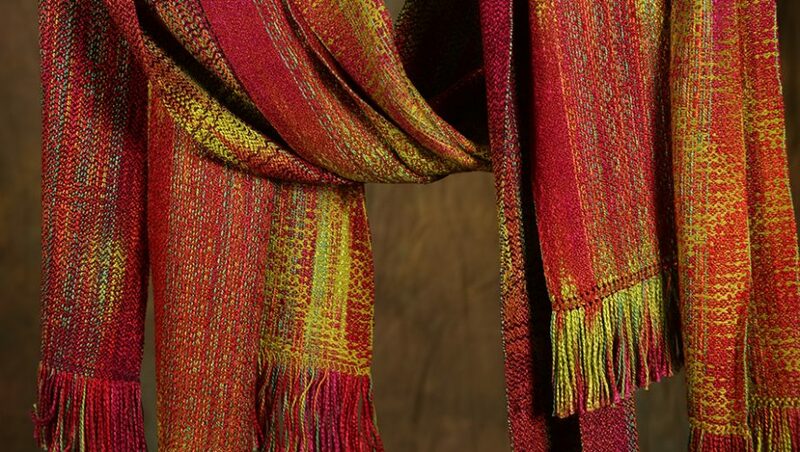 My weaving, happily, goes well, and though quantity has suffered in recent months, quality has not.� Thank goodness!� And it’s been my salvation on many days when everything else seemed too difficult or frustrating or painful. I’m so glad to hear from you.� Happy weaving days to you!